That is the Star-Ledger Editorial Board, once again writing a love letter to charters. Once again, I am here to set them straight. I just went over the clear differences between charter school and public, district school student populations in Camden. A few tweaks of the code, and here's pretty much the same data for Newark. 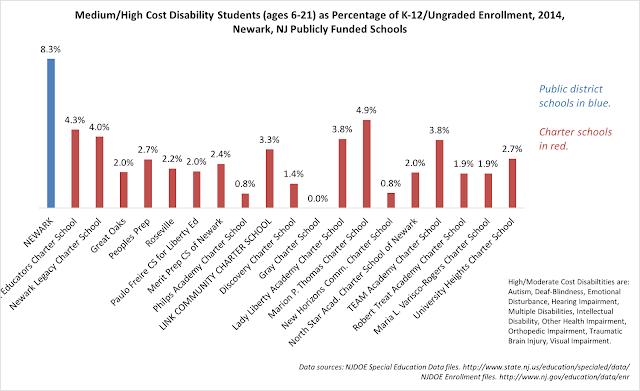 As a proportion of total population, the Newark Public Schools enroll many more students with the costliest special education disabilities. We've been over this time and again: while some Newark charters have upped their enrollments of special education students, the students they do take tend to have the less-costly disabilities: Specific Learning Disabilities (SLD) and Speech/Language Disabilities (SPL). The charters take very few students who are emotionally disturbed, or hearing impaired, or have intellectual disabilities, or any of the other higher-cost disabilities. And when you look at the counts of students as opposed to the proportions, you can see just how stark the differences between the two sectors really are. It is unconscionable that Newark's charters are being "held harmless" in their funding while the district bears this enormous fiscal burden. Just to be clear: I don't think charters should be attempting to educate these students with special needs. By all indications, they don't have the capacity to do the job correctly. NPS has a much lower "student load" per support staff member than the charters. These support staff include counselors, occupational and physical therapists, nurses, psychologists, social workers, learning disability teacher consultants, reading specialists, sign language interpreters, speech correction specialists, and so on. It would be highly inefficient to staff every charter school and network in the city with all of these staff. As I've documented many times, charter school teaching staffs have far less experience than public school staffs. Not only does this create a fiscal burden on charters, who must continually retrain their churning teaching staffs; it creates a "free rider" problem for hosting public schools. 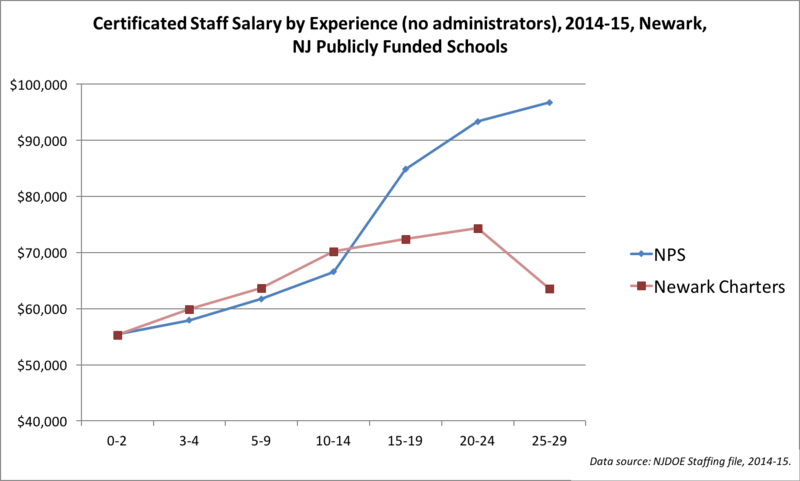 In the aggregate, teacher salaries in the first decade for district and charter teachers in Newark are fairly close. Some of the large charter networks, like TEAM/KIPP and Uncommon/North Star, pay better than the district; most of the mom-and-pop charters pay worse. But that's only until about year ten; after, NPS teachers enjoy a significant bump in pay. Newark charters spend much more per pupil on administration than NPS schools. Part of this is due to charters being unable to leverage economies of scale like the district schools. Part of it is undoubtedly because the schools need more administrators to support more inexperienced teachers. Fortunately for some of the big charter networks -- TEAM/KIPP, Uncommon/North Star, and Great Oaks in particular -- they are able to access resources from their regional and national networks. 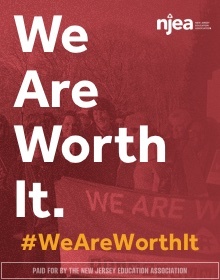 This includes large amounts of philanthropic funding, capital for building new facilities, and tutors whose costs are supported from federal funds. The SLEB claims charters get "no capital funds." I don't know where they got this idea, but it's just wrong; charters may not draw from the same state pool as district schools, but plenty of other monies are available to them for facilities. NPS gave a sweetheart deal to charter operators, who now get to use public monies to transfer public assets to private control. 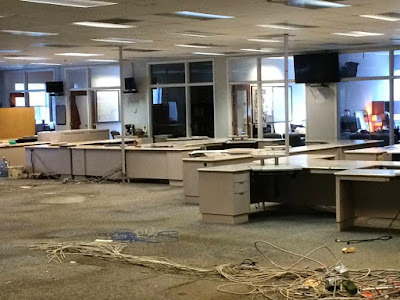 Back in 2014, Owen Davis reported that all of the qualified school construction bonds New Jersey received went to charters. Three charters got to locate in Teachers Village, built with all sorts of financial goodies offered by the state and the feds. And let's not forget that a whole bunch of the Zuckerberg money went to the charter sector. Newark charters enroll far fewer students who have costly special education disabilities, or who are Limited English Proficient, than NPS schools. 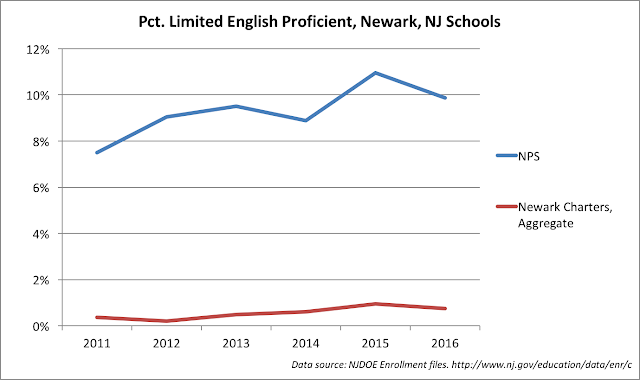 Compared to NPS schools, Newark charters do not have the staffs in place to properly educate these high-needs students. 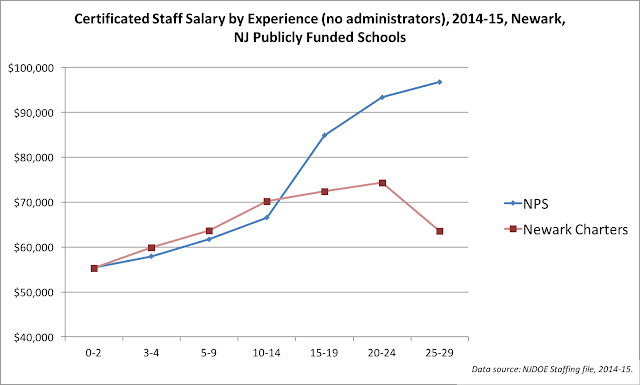 Newark charter staffs have much less experience than NPS staffs. Newark charters are, consequently, "free riding" on NPS schools, which reward teachers for their experience. 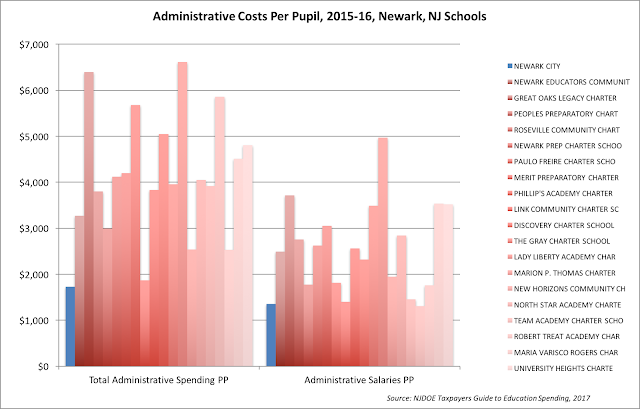 Newark charters have much higher administrative costs than NPS schools. Newark charters have access to all sorts of outside funding and capital that NPS cannot utilize. I've not been one to call for closing Newark's charter schools; at this point, the upheaval might -- might -- be more detrimental to the students enrolled in those schools than the damage being done to the whole system. Some might not like my point of view on this, but I don't think it's right to chance making Newark's schooling system even more chaotic than it already is. 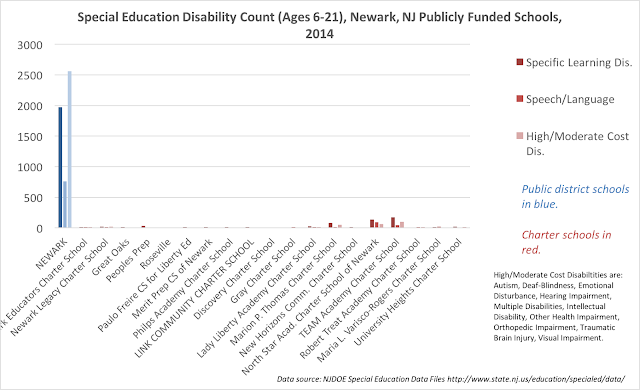 But there is a clear fiscal drain on the Newark Public Schools due to charter proliferation. And it's very hard to justify the harm this causes by pointing to some, frankly, underwhelming gains on standardized tests. The key threats now facing charters in New Jersey are a moratorium on all charter growth, and a local vote being required to open any new charter school. Because top charters in Newark and Camden expand year by year, a moratorium would force sixth graders to transfer back to the district schools, rather than being allowed to continue on to 7th grade. That would clearly hurt kids. And since the teacher's union dominates school board elections with low turnout, giving the board veto power is akin to strangling any new charter in its crib. The better gauge is clear parental preference. First of all: Maybe turnout is low in school board elections because Newark has been under state control for over two decades, which means the election is largely meaningless. Second: What "would clearly hurt kids" who are enrolled in NPS is the growth of a system that holds charter schools harmless in the face of state aid cuts, concentrates special needs children into the public schools, free-rides on teacher salaries, drives more funding into administration, doesn't allow for economies of scale, and puts public assets into private hands. Don't the kids enrolled in NPS deserve well-resourced schools? Don't their parents deserve democratic control of their school system? Shouldn't they have the same say over their schools that suburban parents have over theirs? A moratorium on charter growth in Newark -- and across the state -- is a reasonable policy. Don't agree? Fine, but the idea that charters are unquestionably beneficial to cities like Newark is shallow and ignorant. The Star-Ledger, after its flight from Newark (h/t Wallace Strobe). The Star-Ledger Editorial Board, where everything is made up and the facts don't matter. That's right, the facts are like Betsy DeVos's discrimination oversight.